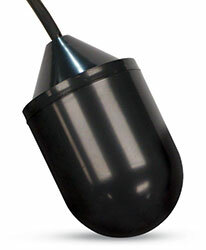 Use these mechanically activated float switches to accurately monitor specific water levels, or for direct alarm actuation in potable water or sewage applications. Their durable ABS construction is leakproof, shockproof and impact-resistant. They are not sensitive to rotation or turbulence. Choose from pump or control duty switches. Wire pump duty switches directly to the pump; control duty switches have to go through a control panel. Select from Normally Open (NO) contacts for pump down or high level alarms, or Normally Closed (NC) contacts for pump up or low level alarms. Note: Removal of piggy-back plug negates UL/CSA approval.